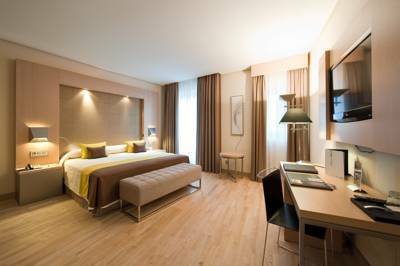 The choice of hotels in Malaga city is vast and varied. The Picasso Museum is in the old city centre which has undergone much renovation and restoration. Many old buildings have been brought back to their former glory, a number of which have been tastefully converted into 21st century hotels, without losing anything of their enchanted past. The Alcazaba is also close by. For information on Apartment Rentals in Malaga, visit our Malaga Rentals page. A new face for the famous Hotel Larios, reception on the first floor, this small hotel has a modern, trendy feel with Art Deco styling. Staff are informally dressed making a relaxed, unstuffy atmosphere. At the top of Calle Larios, the hotel is ideally located for visiting city. Roof bar, with uber-cool black and white designer chairs. Read More. More hotels near Malaga bus station and train station next door.